The JR Cuban Alternative to the La Gloria Cubana Corona cigar is the closest thing you’re going to find to a true Havana. These value-priced long filler cigars are crafted at the most legendary factories in the world with unused tobaccos from the most famous cigars in the industry. 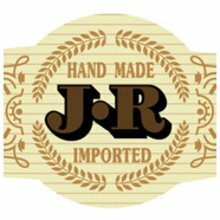 Expert construction, great quality, delicious flavors, and supreme consistency have made the JR Alternatives our best-selling brand for over 35 years. 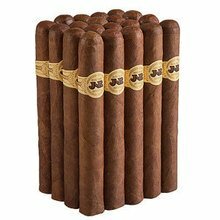 Buy a cellophaned bundle of 20 at JR Cigar today. Excellent copy. Draw, Construction , Consistency are top drawer. Flavor could be a little better as it is somewhat lighter than original. Nice chewy thick feeling to the smoke.... about 6 on the pepper/spice meter. Hints of brown sugar/vanilla. Age will certainly help this batch, like most of the JR Alt's. But man, they are worth getting a couple of bundles and aging at home. Honestly, I am tired of spending $8-$10 for a "treat" cigar and having them taste mediocre.... Occasionally they are worth their price, but I have been burned more often than not. Once you find an Alt blend you like, stock up and reap the benefits. Currently, my fav's are this one and the JR Cuban Alt to Romeo Y Julieta Club King. The Romeo has a bit more kick and lighter body to it.... definitely a different blend. Some could be smoked others not. JR has many others Alternatives that are superior to these. Excellent overall; the draw is very good as well as the construction. The flavors are good as well; of course, not like a Cubano, but nevertheless, a very good enjoyable quality smoke especially for the price. Draw is key and very good as already mentioned ; the wrap is a nice chocolate color that lacks veinage (thankfully). Further, the cigar is packed well, i.e., not squishy or mushy. Flavors will always vary, because smoking is subjective, but usually hints of cedar, wood, and coffee bean are prevalent. It is excellent to pair with coffee, espresso, or a latte. Bourbons or Cognac are also good with this cigar too. Horrible. Half the cigars were dried out when they arrived. Never order these again. My favorite. Good flavor, good draw, good price! Tried and tried on this smoke. Get lots of tunneling and wrappers coming apart. Also it’s a smoke I have to hit very lightly or it gets bitter, to the point it’s unsmokable. It may just be the bundle I bought, but I’m unwilling to try again Mild flavored cigar with decent taste When burns correctly. Every body I give one too wants to buy them. A great smoke at a great price point.. lasts exactly as long as my dog walk, so that's a plus. These taste okay and appeared to arrive in good shape but they don't burn well. I let them sit in my humidor for a few days to acclimate and have smoked 5 so far. Four of the five have not burned well. They keep burning down the sides. Lots of the smoke gets wasted when you keep having to light the unburned side and then break it off. I don't think I'll try them again. I reorder this smoke as it is consistently good; once in a while there is a throw-away stogie, but overall, this is a very good quality and enjoyable smoke. The bland is decent, somewhat medium-body, and usually burns well and thus, has a good draw. Very good smoke for the price and not inconsistent as many of the JR Alternate's in which I've had to throw out 2-4 per bundle, but again, not with this blend or stogie. well worth the price, better than cigars at twice the price per. My go to fall back if I dont want to spend a buck or cant find a better deal. No risk, always good smokes. Once in a while one is a tough draw, but killer price. Side by side with the real thing, its not. Otherwise, great deal. Very nice second. Very smooth and mild. As good as some top shelf brands. Excellent smoke. These rival sticks going for over twice the price. These are my new 'go to' cigars. Love the consistency in this smoke. Glad I found as my daily go to. Look forward to future JR Alterrnate finds. Very good smoke for an excellent and more appropriate price. In the bundles, there may be one or two smokes that are not rolled correctly, i.e., a hole in roll, but that can happen in any cigar even pricey ones. Overall, very good smoke and most consistent in flavors and quality.